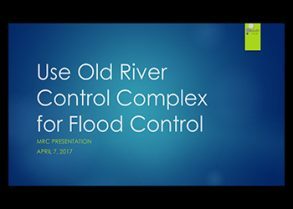 USE OLD RIVER CONTROL COMPLEX FOR FLOOD CONTROL. I appreciate this opportunity to testify again. Last year I talked about flooding at our farm in the Natchez reach 20 miles above the Old River Control Complex. Today I’m talking about flooding in the Baton Rouge reach below Old River. I hope to show that ORCC can reduce the height, duration, and frequency of floods – and to persuade you that it should. I assume everyone here knows that Old River is where part of the Mississippi flows down the Atchafalaya River to the Gulf at Morgan City/Wax Lake – and that the ORCC controls the flow. And that the Corps operates it. ORCC increases flooding. But you may not know that the Corps doesn’t operate it to reduce flooding. And you may be surprised to learn – as I was – that its operation frequently increases and prolongs flooding. Yes, that’s right. The Corps makes floods higher and longer. Let me explain. It’s not malicious. But it happens because the Corps follows an order issued 63 years ago. It requires the Corps to maintain the 70-30 split of the flows of the Mississippi and the Atchafalaya to the Gulf that existed in 1950. The order keeps the Corps from doing its job of reducing and preventing floods. It’s outdated and harmful. It’s time to change it. The 2016 flood shows why. 2016 flood. The 2016 flood was the highest January flood on record. It crested 8 feet above flood stage at 43 feet – one foot below the record flood of 2011. The high crest increased levee risk. The river was above flood stage 51 days, and the batture flooded over 3 months. During the 2016 flood the Corps opened ORCC to 79% of capacity for less than a week. Then, cut it to 35% and then further to divert just enough flow down the Atchafalaya to maintain the 70-30 split – but not to reduce flooding. So it had little effect on the flood. If the Corps had opened ORCC to 100% capacity for three weeks, the crest would have been 8.3 feet lower – according to a model the Corps ran at our request. The river would have crested below flood stage. There would have been less levee risk and a shorter flood. To repeat: the 2016 flood would have been lower, shorter, less dangerous, and less damaging if the Corps had operated ORCC to reduce flooding instead of to maintain the 70-30 split. ORCC could reduce flooding. ORCC can reduce the height and duration of floods as the model shows – but doesn’t. It could also reduce the frequency of floods by discharging more flow to lower the rising river. But it doesn’t. It uses only 22% of its capacity to divert the Mississippi’s flow. And that’s to maintain the 70-30 split, not to lower the river. It has operated at capacity (2011) only once since it was repaired in 1973. Floods started increasing about 1972 when the river started rising. Before then the Baton Rouge reach was above flood stage only twice in 23 years from 1950 to 1972. It has been above flood stage 7 out of the last 10 years. The batture has flooded 10 years straight. And there have been two once-in-a-hundred year floods (2011 and 2016). Odds are over 1000:1 against two such floods within five years by chance. Higher river = more floods. The average river stage is 5 feet higher in the Baton Rouge reach and 10 feet higher in the Natchez reach than in 1950. The higher river and more frequent floods go together. They are correlated. You may think the river is rising because it’s raining more. It’s not. Rainfall in the Mississippi drainage basin has been essentially flat since 1972. But now when it does rain and snow melts, the runoff is greater and faster because of urban development. And it flows downriver faster because Corps projects have straightened and shortened the river. But it doesn’t discharge faster at ORCC. So the river rises. ORCC could drain the river. But the order stops it. It also stops the Corps from changing flows to manage the level of the river. For example, the Corps could increase or decrease flows to keep the river between 20 and 25 feet much of the year – deep enough for navigation but not enough to flood the batture. But it doesn’t. 70 – 30 sacred? So why isn’t ORCC used for flood control? It makes no sense. Is there something magic or sacred about the 70-30 split? Is there some scientific basis for it? I don’t think so. But it does have 63 years of precedent going back to the 1954 Flood Control Act which gives the Corps broad authority. The Corps reads the Act to require the 70-30 split to maintain the “desirable” distribution of flows and sediments that existed in 1950. Is that distribution still desirable today after 63 years of change? I don’t think so. The river is higher and rising, it’s flooding more, and the marshes are subsiding. It’s time to change how ORCC is used – so the Corps can do its job of preventing and relieving floods. And to reduce flooding. But won’t the Atchafalaya flood more if the Mississippi floods less? The answer is yes – but. It’s yes – but the Atchafalaya is a shorter steeper route to the Gulf. So the flow to the Gulf will be faster, and floods will be shorter. It’s yes – but the Atchafalaya floodway has flood easements. There are no easements on the Mississippi which floods now by default. Moreover, flooding on the Atchafalaya can be minimized by adjusting flows from the Mississippi when it is below flood stage. Its discharge capacity could also be expanded. In any event the Corps will have to make good, safe decisions to distribute flooding fairly for the greater common good. I’m confident it can and will when it has the flexibility. Congress key. The Corps takes orders from and is funded by Congress. It can tell Congress it’s a good idea to operate ORCC for flood control. Those of you here today can tell your Senators it’s a good idea. They can tell my Senators, one of whom chairs the Senate Appropriations Committee. And things can change. No part of these presentations may be circulated, quoted, or reproduced for distribution without prior written approval from Bigger Pie Forum. These materials were used during oral presentations; they are not complete records of the discussions.